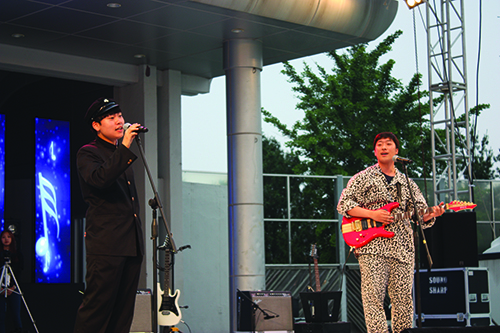 ▲ 'Twinpolio,' a student band in Dongguk University, is showing a performance. The name “Bomkkiri Festival” was given for the first time which represents Dongguk University’s spring festival. Its meaning is having fun in spring with the elephants, the symbol of Dongguk University, and your beloved friends. “We wanted to give students a break to look back their schooldays,” said Jo Seong-woo, the vice chairperson of the GSC. On the first day of the festival, the school set rides in the campus such as the bumper car and the euro bungee. The next day, four student teams showed a performance in a talent show. Also, Mad Clown and Jang Ki-ha and the Faces had a special performance. On the third day, there was another main stage produced by the Club Association and 9MUSES and LovelyZ came as special guests. Lastly, on the fourth day, a giant play zone was opened at Manhae Square.